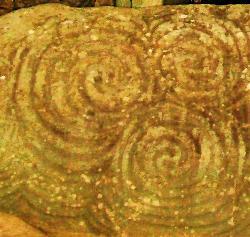 The triple spiral in this picture comes from the stone on the entrance to Newgrange Cairn heritage site Co Meath. There are many interpretations to the meaning of this symbol. It encompasses our connection to the divine and to the Earth in an never ending spiral of personal development.